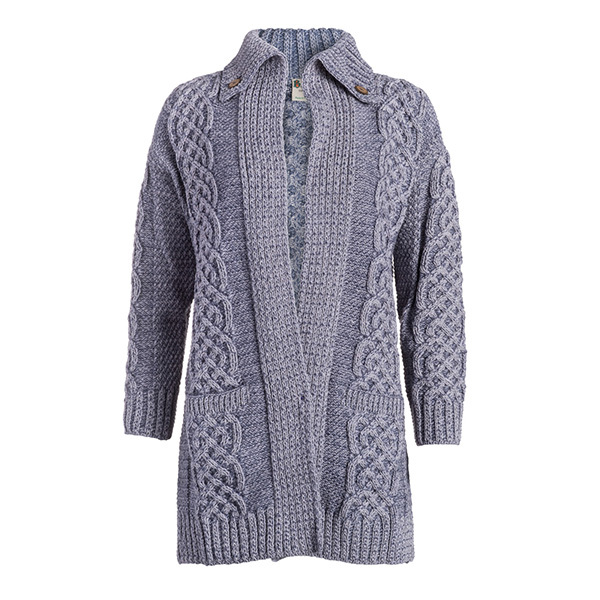 Whether worn for warmth or for style, this gilet cardigan is sure to not disappoint. As a gilet style cardigan, this piece features a sharp vest frame that is great for layering with shirts for extra warmth while adding some unique personality to any look. It also has a sophisticated open design that is perfect for style versatility. The vest also features a variety of braided and rope cable patterns along with basket stitch trimming that represent hopes for prolific efforts, making this cardigan both beautiful and meaningful. Adding a practical touch are the two front pockets to warm the hands or keep items handy, along with a raised collar that provides extra insulation for the neck. Make this soft Merino wool cardigan a fun part of your sweater weather wardrobe that will never go out of style!